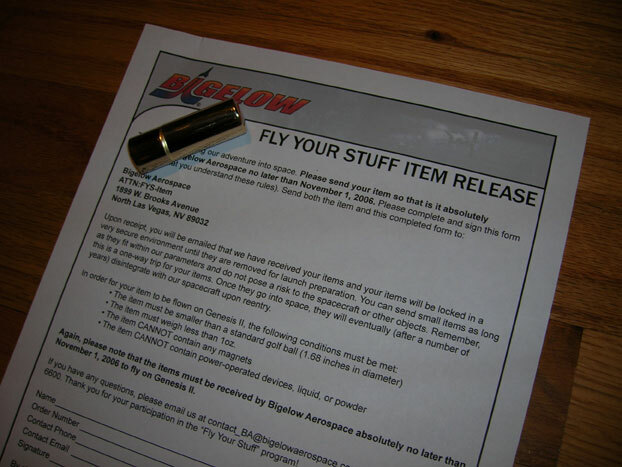 If you bought a “Fly Your Stuff” package on Genesis II and naturally assumed the launch would be delayed and you’d have plenty of time to deliver your Stuff to Bigelow Aerospace HQ in Las Vegas — check the countdown clock at Fly Your Stuff. Bigelow Aerospace publicist Chris Reed says a few payload spots are still available even at this late hour. Can you believe that? 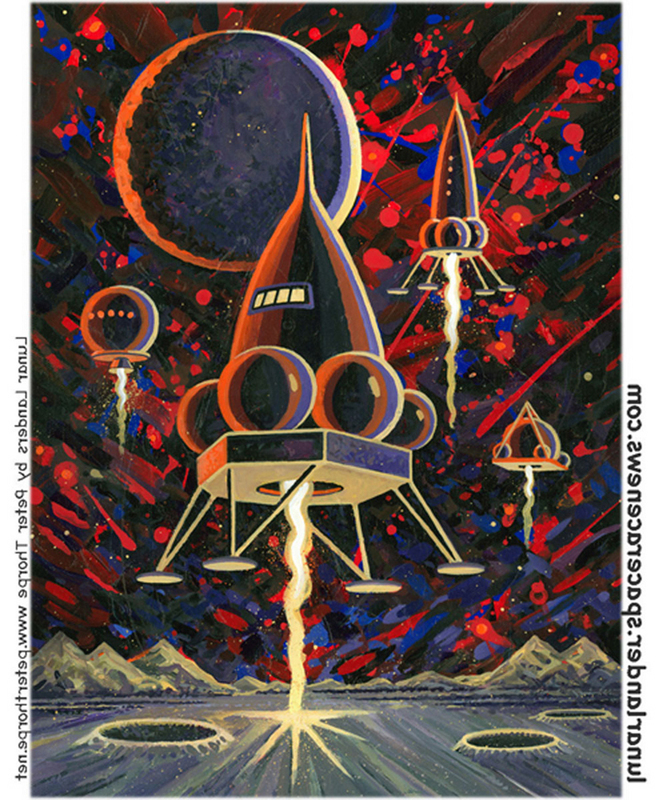 The space bargain of the century is not quite sold out, only two days before the offer expires. For only $295, you can send a photo — or an item no bigger than a golf ball, lighter than an ounce, no powders or magnets or liquids or power-operated devices (darn), but a real something-or-other — to space for what might be quite a long stay in Earth orbit, eventually to be part of a brief light show when Genesis II disintegrates upon reentry to Earth’s atmosphere. This is a very low price point and it even comes with a very good Money Back Guarantee: If you don’t get a picture of your Stuff floating around inside Genesis II from orbit within 90 days, you get your money back. Please name one other space launch service that compares to this offer in any way. Recent space traveler Anousheh Ansari told Oprah the other day that she would agree to pay her Russian space transportation provider even if the trip was one-way. Space Services Inc. now offers the Earth Return service, a brief joyride for cremains, touching the edge of space then recovered on Earth a few miles away if all goes as planned. No guarantees, no money-back offers, and the list price is $495. Sorry but this does not grab the space bargain-shopper in me. Honestly, what thrifty space bargain shopper would go for this when there’s still space available on Genesis II? David Livingston, host and creator of TheSpaceShow.com tried to book an orbital flight for the ashes of his beloved dog Biscuit with Space Services Inc. but was turned down because the company didn’t want to send dog cremains on the same flight with famous human cremains like James Doohan (Star Trek’s Scotty) and astronaut Gordon Cooper. Some Biscuit ashes do have a ride scheduled on Space Services Inc.’s Earth Return service (now predicted to fly January 2007 with Up Aerospace), but the best ride (for the price) for what remains of Biscuit will be in the vintage lipstick case pictured here. Yes, ashes are “powder,” and they do break the Fly Your Stuff rules just a little… but Bigelow Aerospace will make an exception for Biscuit so long as the ashes are safely encapsulated in this space-safe vintage lipstick case. Who doesn’t like a space program that’s willing to break a rule now and then…?